The Revs. 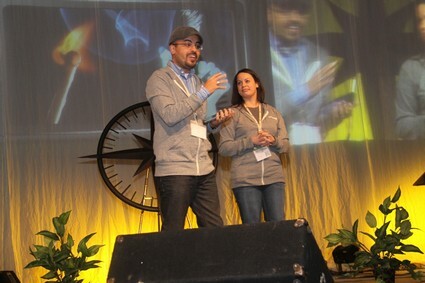 April Casperson and Juan Huertas on stage at Exploration 2011. God’s call can be heard in a series of small daily moments, through the voice of a fellow church member, a pastor or a campus minister, or during a mission trip. And more than 30 United Methodists who have heard the call to ordained ministry blogged and Tweeted about their personal experiences to generate buzz about attending Exploration 2013. “I still was unsure of my call to ordained ministry. At the time I was told by my mentors, `We see your call, so trust us. Get ordained and live into it.’ So that is what I did, taking baby steps along the way, learning as I went, claiming my authority as I lived into it,” wrote the Rev. Beth Ann Estock, an ordained elder in the UMC, during the April 4 blogging event. Every call to ordained ministry has a story, said the Rev. Trip Lowery, the General Board of Higher Education and Ministry’s director of Young Adult Ministry Discernment and Enlistment. “Sharing our stories strengthens our connection. We find common points of contact and places where our story intersects with the story of a fellow traveler. Stories offered can be affirming, encouraging, and enlightening to others. Hearing how God is moving in the lives of another helps us discern where God is moving in the midst of our own,” said Lowery. Registration is open for Exploration 2013 in Denver, Colo., an event for young adults age 18-26 to hear, discern, and respond to God's call to ordained ministry in The United Methodist Church. Bloggers described many varied experiences. “I never had that single moment when I turned to follow Christ. I can remember pieces of a lifelong series of small, almost daily moments when I am invited to reaffirm my desire to live and walk in God’s grace. Discerning my call to ministry follows the same lines,” said the Rev. David Morris, a pastor in Iowa. Morris also wrote about how God’s call continues throughout ministry. “We cannot rest secure in how we responded in the past, and we can’t always be waiting for something that might come in a future moment. God comes to us right here and right now and that is the best gift that we can be given. The best I can ever say in my life is that God is calling me now to the shape of my ministry,” he wrote. The Rev. April Casperson, a deacon who is director of Admissions at Methodist Theological School in Ohio and co-chair of the group planning Exploration 2013, wrote about how many people were involved in her call – her pastor, church members, professors, her husband, other clergywomen, the people who funded the UM scholarships that helped her complete her education, and her peers in classes. The Rev. Jeremy Smith, a UM elder who writes the Hacking Christianity blog, said his call to ministry was a gradual process. “There was no flaming dove that came down from heaven, there was just a little bit of empowerment that went a long way, that gave more saltiness to something that was already there that yearned for that saltiness. And I am forever appreciative,” Smith wrote. The Rev. Juan Huertas, a UM elder in Baton Rouge, La., and the other co-chair of the Exploration planning team, wrote about his childhood experience in a church that was fruitful, alive, and making a difference, as well as the influence of the pastor, his father. “Our mission was rooted in the neighborhood that we lived in with a clear understanding that there was also a larger world in need of Jesus Christ,” he wrote of the church. especially his commitment to leading God-centered worship with integrity and passion, and his hunger to help the congregation and the community find healing, wholeness, and love. To learn more, register for Exploration, or apply to be a speaker, visit www.explorecalling.org.